Mahogany Body and Flamed Maple Top Mahogany is revered for its sweet sustain, smoldering tone, and an acoustical range that extends all the way from deep octaves to a singing upper register. Mahogany is also valued for its color, grain, stability and high-strength/low weight ratio. A real plus when you have to stand up and play for hours at a time. Visually, the curly pattern of flamed maple is breathtaking. Acoustically, the wavy fibers reduce the long grain stiffness and vibrate more freely - the secret to the bright, clear powerful sound. BTB5 Neck and Rosewood Fingerboard The Ibanez BTB1205E Prestige features neck-thru construction. 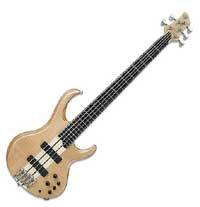 The Ibanez BTB1205E's 35" scale offers tight tension with no flopping, superior articulation, and excellent sustain. 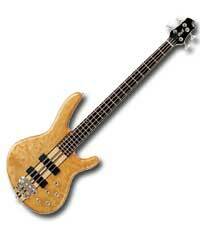 Perfect for 5-strings and detuned 4-strings. An off-center line shape makes the upper fretwork on the Ibanez BTB1205E as easy to play as lower fretwork is on a standard neck. The Ibanez BTB1205E's Rosewood fingerboard offers a strong, bright sound and an attractive appearance with a long grain complimented by Abalone offset dot inlays. Custom Pickups and 3-Band EQ Bartolini pickups custom-designed for Ibanez complement the 35" scale of the BTB1205E Prestige bass. Bartolini pickups provide deep, warm tones while retaining treble emphasis. The Bartolini active 3-band EQ features fully independent bass, treble and mid controls and a mini switch for quick mid-frequency adjustments of 250hZ, 500hZ and 1kHz. 18-volt circuitry provides much greater headroom than found on standard active EQ's. The Ibanez BTB1205E also features the new Mono-Rail IV bridge, which offers even greater string-to-string isolation and easier string changes. Flamed Maple top, Maple/Mahogany back with Natural finish. 5-piece Pretsige thru-neck design with Rosewood fingerboard and Abalone off-set dot Inlays. Bartolini custom pickups and 3-band EQ. Mono-Rail IV bridge and Neutrik locking jacks. The Artisan, one of Cort's long-term best Bass, is made of selected tonewoods featuring Bartolini designed mk soapbar pickups and electronics. This setup emphasizes the acoustic qualities of the bass with enhanced tonal balance and deep resonance. The 410XL features a twin chamber, dual-ported design and four 10XL drivers. 400 watt power handling and a frequency response of 30 Hz to 5 kHz. Classic Hartke. The XL Series provides the highest performance at every level. Each cabinet is carefully calibrated and tuned to give you a smooth, balanced response along with an articulate, high-impact attack. 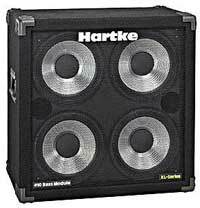 Equipped with custom Hartke XL aluminum-cone drivers for maximum response, the XL Series also features high-quality 3/4 in. + 5/8 in. composite plywood construction and a shockproof metal grille. 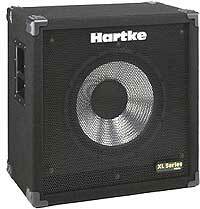 210 XL Hartke single chamber, sealed cabinet with two 10" aluminum-cone bass drivers. Power handling is 200 watts at 8 ohms with a frequency response of 50 Hz to 5 kHz.